The Voice India 2017 Winner Season 2 Grand Finale: Check who won this year’s The Voice India title. 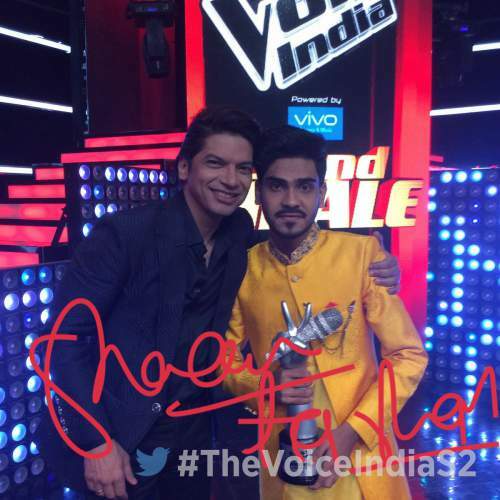 Farhan Sabir from team Shaan has won the season 2. The singing reality tv show has been interesting to watch since the past few months on &TV. It has seen some of the very talented singers across India competing with each other. All the contestants were divided into four categories each one with the four coaches – Shaan, Neeti Mohan, Salim Merchant, and Benny Dayal. The judges have done a fantastic job till now. After so many rounds, we have finally reached the grand finale which is taking place tonight, March 12, 2017. With tonight’s show, the winner of The Voice India season 2 will be revealed. It will surely be a star dubbed evening with Asha Bhosle to be seen on the stage. Apart from the star performances, the audience will be eager to catch who will become the winner of TVI 2017 among Sona Vakil, Rasika Borkar, Farhan Sabir, Parakhjeet Singh, Niyam Kanungo and Sarayu Date. Stay tuned live with The VoiceIndia season 2 Grand Finale updates in the realtime. A lot is going to take place today. The biggest and most anticipated part will be to watch the performances of the top 6 contestants and declaration of the champion. The latest reports say that Anushka Sharma will come to promote her upcoming film Phillauri. Apart from Anushka, Asha Bhosle, Mika Singh, and Kumar Sanu will be seen performing on the stage for the final night of this year’s part. All of them will make the night very sweet and melodious. It is also being reported that TV actors like Krystal D’Souza will bring the fire on the stage with her incredible performance. The top four contestants are as follows. After the eliminations of Sona and Sharayu, Asha Bhosle shakes leg on Yeh Mera Dil and Piya Tu Ab To Aaja. The legendary singer gave away gifts to the top 4. Prakhar sang Kala Chasma from Baar Baar Dekho. Rasika sang Hungama Ho Gya. Asha ji liked it very much and sung a few lines with her. Anushka rapped on Naughty Billo and urged to watch her upcoming film and left. Asha ji sang Rang Barse and left. Benny Dayal and Salim Merchant presented mesmerizing acts. Shaan and Neeti had a humorous session acting as lovers on Woh Ladki Hai Kaha, and Kheech Meri Photo. It was magical. The winner, Farhan was called on stage and crowned. Following is what the champion received. The top 4 received a gift hamper from Alto and handsets from Vivo Camera and Music as well. Mohd. Danish won the title of ‘Yamaha Fascino Most Stylish Singer Award’ along with a super stylish Yamaha Fascino bike. In the meantime, who do you think will be The Voice India 2017 winner? Comment the name in the section below.